The “Zambian Bug” is an illness that haunts Zags during their stay in Zambezi. History of past trips has shown that it will terrorize at least half our trip so I was well aware that my time would likely come; I just didn’t think it would come three hours into our trip. Yes, while standing on the dirt road with millions (exaggeration) of children waiting to welcome the last two flights of Zags, the Zambian bug resurrected my lunch. The next forty-eight hours were nothing short of miserable. Between constant vomiting, a fever, dehydration, exhaustion, and delusion, I was attempting to make this new place feel like home. I have never felt such misery, fear, and frustration as I did during this time. The illness was enough, but add on the conditions in which we were adjusting to and the misery was magnified. As I lay in bed with a high fever, the sun beat in through the broken windows making the A/C free convent even hotter. My vomiting throughout the day turned into vomiting in the dark because the power gets shut off at 12am daily. Even reaching for a simple glass of water was a difficult task because the water is contaminated and shuts off randomly. My best bet of getting better was some good sleep but of course that wasn’t going to happen because of the dog fights, rooster crowing, and bus horn sounding randomly throughout the night. Being sick with the Zambian bug was absolutely the most miserable experience I have gone through because of added obstacles and fear of the unknown. I didn’t think it could get any worse; and then I felt a bug crawl up my leg as I slept. While I was selfishly feeling bad for myself and wanting to give up on this trip, I was oblivious to the beauty and lessons God had placed around me. Lying in bed, having these thoughts, I could hear my Zag fam singing and dancing in the kitchen to “Fear” which reminded me of how lucky I am to have these beautiful souls to journey along with. I thought back to when Abbey reminded me that she loved me while she changed the cold washcloths on my head. I reflected on how Katie B. left everyone notes of praise and motivation because…well because she’s just that sweet. Even that moment I peeped into Elly and Mercer teaching their sixth graders and hearing them singing along with their class. How lucky am I to be surrounded by this inspiring, selfless, goofy, passionate- quite frankly- weird group of people. I’ve been blessed to be a part of this group. I knew I couldn’t let my fears fail me and my team. Many of us have struggled with the thought of coming to Zambezi and teaching classes. While we want to come and offer what we can to this community, we are careful of the power dynamic. The beauty of this trip is that we are here to be present with these people and experience an exchange of perspectives and culture; not to feel empowered by fixing or helping. I’m a nursing student. Yes, I can talk to you about catecholamines and what causes orthostatic hypertension (shout out to A&P) but I don’t know the first thing about health in a third world country. So, for the past semester the thought of standing in front of a group of Zambians to teach a health class made me uneasy. As strange as it is, being sick was a huge blessing because I experienced first hand health in this country. 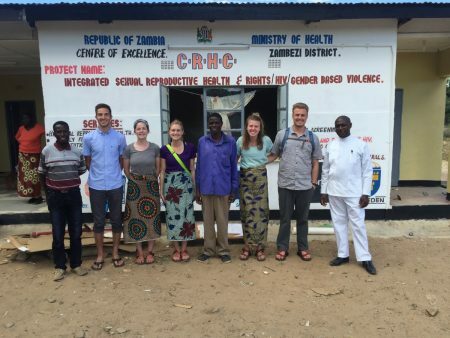 Though being ill was only a sliver of exposure into this complex issue, it changed my mentality in our class and at our visit to the Zambezi Hospital. I was humbled as our team met with the community members who eagerly asked questions and saw the works of the doctors who made use of the few resources available. On our visit to the local hospital, Dr. Titus so graciously toured us through the facility. It was crowded, hot, and chaotic. But it was inspiring to our team because we recognized their resilience in overcoming the obstacles in order to bring dignified care to the people of Zambezi. Had I not been sick in the beginning, I don’t know if I would have understood the complexity of dealing with health care quite like I did once I experienced it. Each of these individuals is inspiring. Every single person has brought comfort and laughter to one another. Each person has a passion that they are sharing with the Zambezi community. Each has a selfless heart which they are sharing. I don’t know where this journey will take me, what kind of person I’ll be at the end, or what ways my heart will be shaped. But what I do know is that I love this family of mine, the beautiful faces of Zambezi that have so graciously welcomed their homes and hearts to us, and the crazy ways in which God is shaping us. We are alive and thriving. Wow, what an experience to kick off your trip! I am glad you are feeling better, Hayley, and thanks for the beautiful blog. It sounds like you are surrounded by wonderful people! Take care! Wow Hayley, what a way to find a God’s Will in things….I am sorry you were feeling so crummy though. I am sure the medical knowledge you have feels insignificant, but trust your (feeling better now) gut. Don’t push too hard too fast. To Hayley’s mom, I am proud of this young lady…I can only imagine how you feel! You are all so inspiring. Love and miss you so Katie Polacheck! My baby girl, my heart dropped when I began to read this, but, just as you always do, you moved through this situation with grace and found blessings. I am so proud of you and everyone in your Zag Fam. You are each finding blessings that will inspire you through some uncomfortable challenges. One question, Hayley…did you call out, “mom, mom, mom, mom?” you will have to explain to everyone! I love you, honey and I am glad that you are feeling better. I am glad you are feeling better. After the first paragraph, I had to know who was writing. I am certain Katie predicted this. Being sick while traveling, is never fun but I am grateful you are surrounded by good people. Take care and have fun! Hugs from Oregon! oh Hayley! I read the first line and my mind immediately thought “oh no, this cannot be Hayley. Don’t let it be Hayley.” so I quickly scrolled to the bottom to make sure it wasn’t you and well…girl, you are so strong. Your faith is beautiful and leads others to see our Good, Good Fathers hands in it all. Thank you for sharing with us the love that surrounds you and the ways you have fully embraced everything God has brought your way(even when it’s yucky, terrible stomach stuff). You are incredible and I love you. Katie B-as I was packing up my room I found so many notes that you have left me over the year. Each one so full of love and thought and care. 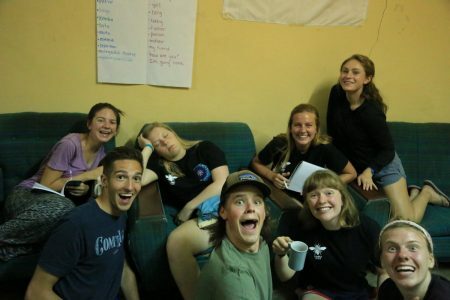 Reading that that piece of you has been a light to those on the trip is no surprise-I cannot wait to hear about(and one day see) the love you spread around Zambezi, both in notes and in your actions. I love you so much girl and am so proud of you. YOUR FACES-oh that picture made me so so happy. I am glad you are doing better, the beginning of your blog was tough to read. However, you powered thru like you do with every challenge. Your blog was beautiful and the way you describe your experiences are beyond anything anyone could imagine… except for those who are there. Wow I am so proud of you!! Hayley, although concerned as I read your comments I finished with my usual tremendous pride in you and what you have accomplished ……. and will accomplish in the future. Love you, Pops. Hayley- The plague is the worst thing ever, but I promise you’ll be laughing about it later after you come back. I’m glad you’re feeling better and I hope you and the Health Team are having a good first week of class! Mercer – your blog was beautiful and I couldn’t help but smile as you recounted Steven’s math adventure. You are definitely going to leave a positive impact on this community and the fact that you are already aware of where you belong means that your heart is in the right place. Don’t doubt how meaningful you will be to your students. Can’t wait to hear about the rest of your classes! Meg- I have a feeling Zambia fits you well. I can picture you playing soccer with all the kids and all the laughter and joy that must accompany it. KP – I am in solidarity with you this week. British cheese and dairy DOES NOT go well on my tummychoochie and needless to say it’s been a flash back to dipilata. Hope you’re feeling better and collecting flowers for your hair. Matt – are the children obsessed with you yet? You are on such an incredible journey and I’m proud to have you as a friend. I cannot wait to hear about your adventures. I don’t want to make this too long, as I’m sure you all have a busy day ahead of you, but sending love to everyone and can’t wait to see a new post ! Thank you for being the first one to get sick – so now you can nurse everyone else through it with grace! And thank you also for posting a picture of my sweet Elly sound asleep in the midst of all of you Zags! Oh Hayley so sorry about your tummy issues. But so glad to hear you are better. We read the Blogs each day and enjoy hearing about your trip. What a blessing to learn of other countries and their people. You will remember and value this experience always. Take good care” Girlie Girl ” and remember how much your Mimi loves you. Enjoy this time. God bless you and all the Zags. Love you and soooooo! Proud of you❤️ Mimi. I’m so sorry you had such a rough start, but so thankful that you’re feeling better! Leave it to you, though, to find such positivity from such a difficult situation. Thinking about you often and praying for you EVERY day!! “Watch, stand fast in the faith; be brave, be strong”. Katie! Sounds very familiar to hear about you leaving notes just for everyone just because you’re that sweet. Speaking of sweet…I thought I might update you and let you know that Bernie Sanders won the Oregon primaries. Yay! Haha but back to you, I love reading these stories and thinking of all these people who get to experience the light and sweet heart that is Katie Barger. I almost wish I could hear all of their stories and their experiences with you! I am saving pictures you guys are sharing and am so eager for the next story 🙂 Have an amazing day sweet Katie! Love you much! Just like mom, I took had my heart sink at the beginning of your blog. But I already knew you wouldn’t let this hold you back. You amaze me in the ways you are able to pull positive energy out of every situation that you experience. We should all strive to find God’s precious light in everything we face. I know I do and you are my biggest inspiration for that. I admire your courage to take on this trip and look up to you in so many ways. I am so glad you have so many like-minded people around you to experience this journey with. You have the most beautiful heart and I could not be more proud to call you my best friend and sister. I love you so so much and can’t wait to keep reading about your many adventures to come! Wow, so sorry to hear about how ill you were, and so happy to learn of your recovery! May this Zambian flu bug not spread, so grateful you have each other to lean on. We love to see the pictures, and got a little more than excited to see Meg jumping into the last photo! Looking forward to the next blog to learn about all of your experiences. We’ve been following the blog daily and anxiously waiting for your post….but were hoping for better news. As we read it today, Mia had a tear running down her face, so sad you were sick. As I tucked everyone into bed, they needed assurance that they wouldn’t somehow get the Zambian bug in the night . The worst is now behind you, enjoy this amazing adventure!